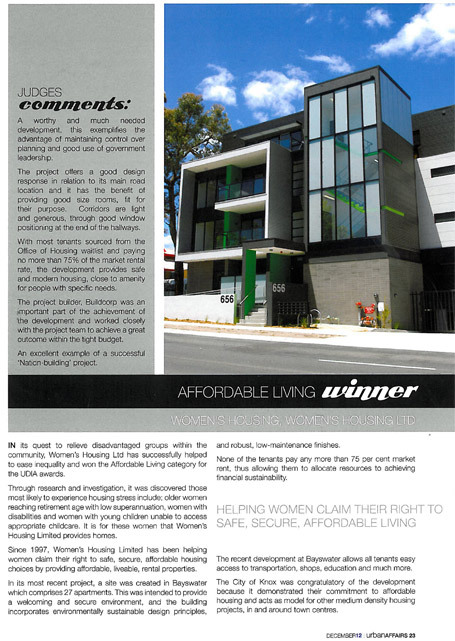 Women’s Housing has won the Affordable Living category for the UDIA awards in Victoria. To relieve disadvantaged groups within the community, Women’s Housing Ltd has successfully helped to ease inequality and won the Affordable Living category for the Urban Development Institute of Australia (Vic) 2012 Awards for Excellence. Through research and investigation, it was discovered those most likely to experience housing stress include; older women reaching retirement age with low superannuation, women with disabilities and women with young children unable to access appropriate childcare. Executive Director of UDIA Victoria, Tony De Domenico said, “The Women’s Housing Limited Bayswater Project, which comprises 27 apartments, was intended to provide a welcoming and secure environment”. Since 1997, Women’s Housing Limited has been helping women claim their right to safe, secure, affordable housing choices by providing affordable, liveable, rental properties. A worthy and much needed development, this exemplifies the advantage of maintaining control over planning and good use of government leadership. The project offers a good design response in relation to its main road location and it has the benefit of providing good size rooms, fit for their purpose. Corridors are light and generous, through good window positioning at the end of the hallways. With most tenants sourced from the Office of Housing waitlist and paying no more than 75% of the market rental rate, the development provides safe and modern housing, close to amenity for people with specific needs. The project builder, Buildcorp was an important part of the achievement of the development and worked closely with the project team to achieve a great outcome within the tight budget. An excellent example of a successful ‘Nation-building’ project. 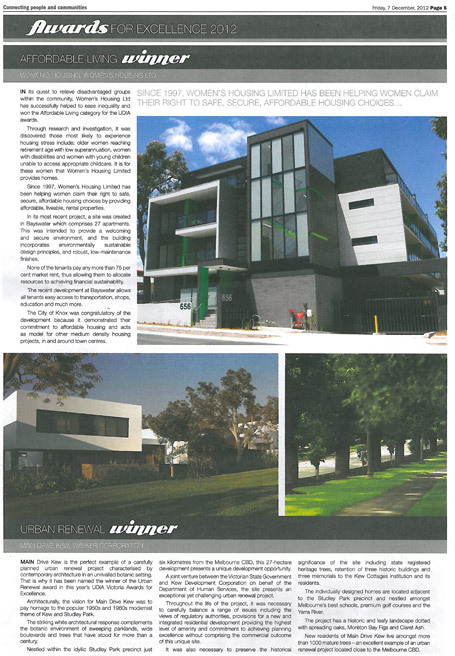 UDIA 2012 Awards Recognise Outstanding Standard of Residential Development in Victoria. The Urban Development Institute of Australia (Victoria) today said the winners of its annual Awards for Excellence for 2012 reflected the high standard of planning and construction in residential communities throughout Victoria.